Participants at the seventh World Urban Forum crafted the The Medellin Declaration, which advocates for placing equity at the center of sustainable urban development. Photo by Mariana Gil/EMBARQ Brazil. Over 22,000 attendees gathered in Medellín, Colombia for the Seventh World Urban Forum (WUF7) from April 5 – 11, 2014, sharing ideas, experiences, and challenges for creating more sustainable and equitable cities. 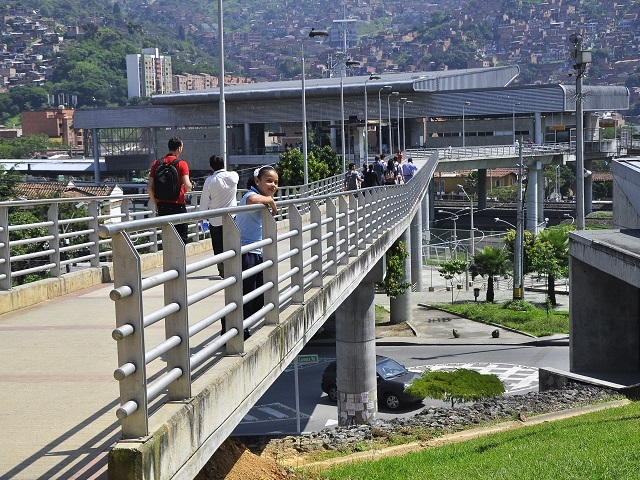 The conclusion of the WUF7 saw the release of a Medellín Declaration entitled “Equity as a foundation of sustainable urban development,” linking this forum to the broader international agenda. Specifically, this declaration holds clear implications for urbanization in the post-2015 development agenda – the definition of the Sustainable Development Goals (SDGs) – and 2016’s HABITAT III conference. These SDGs will build upon the United Nations’ previous set of Millenium Development Goals to set the course for international development for decades to come, and arenas like the WUF7 are key to defining these goals. That’s why this Medellín Declaration, coming just five months from the formal proposal of the SDGs to the United Nations General Assembly in September 2014, is significant in appropriately placing sustainable urbanization on this agenda. The declaration covers quite a bit of ground, reflecting the diversity of interests with a stake in urban development, but highlights two key points: the city as opportunity and a new urban agenda. This article will explore where the declaration hits the mark and where more is needed to shape the sustainable cities of the future. Introducing and integrating equity into the urban agenda is important – particularly given increasing urbanization worldwide and especially in the developing world. Creative interpretation of “all means and resources” links this declaration to policies, financial resource allocations, and both government and non-governmental initiatives at local, national, and international levels, integrating these efforts more coherently than in the past. This injects a new emphasis on equity as a response to structural challenges in cities. Tying the urban development agenda to concepts like ‘moral obligation’ and ‘social justice’ – terms used by many experts in the field but often absent from international declarations – suggests that the gap between on-the-ground experiences and policy dialogues may be closing. We at EMBARQ and TheCityFix are happy to see this focus on people-centered cities, as well as recognition of the lack of appropriate legal framework and planning processes. The auto-centric approach to urban development is still too common across cities in emerging economies, but we’ve also seen some encouraging progress. For example, Mexico’s efforts at urban reform are a positive step in terms of national level leadership in urban planning and policy. Through six core reforms, Mexico aims to link current urban trends with future needs, promote participatory and inclusive local governance, and incorporate access and equity into urban development. These reforms, set forth in Mexico’s 2013 National Development Plan (PND), can help reverse Mexico’s history of urban sprawl and reorient cities around people and communities, responding to many of the calls of the Medellín Declaration. This statement acknowledges the importance of sustainable cities in the post-2015 agenda, but does not explicitly call for a separate sustainable development goal on cities, which many experts and activists have advocated. However, this is understandable given that the declaration is a document of UN-HABITAT, and as the negotiations on the SDGs are still ongoing within the United Nations, UN-HABITAT is unable to make a firm commitment. It is also disappointing that the declaration includes no mention of a “right to the city,” a popular topic among participants at the WUF7 and the core theme of WUF5 in Rio de Janeiro. This is more surprising given how central this theme is to the notion of urban equity, which is heavily emphasized in the declaration.